WASHINGTON (CN) – The D.C. 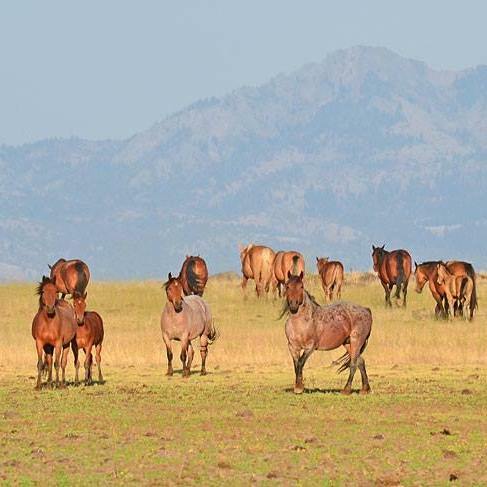 Circuit slammed regulators Friday for attempting to withdraw 23,000 acres from a wild horse sanctuary after 26 years of protection they now attribute to a mapping mishap. Located in California’s Modoc National Forest, the Devil’s Garden Wild Horse Territory was first described back in 1975 as containing two tracts of land separated by a 23,000-acre section in the middle that was not protected. Making up just one-seventh of the 1.6-million-acre forest, the two tracts combined cover approximately 236,000 acres. When the U.S. Forest Service published a forest plan for Modoc in 1991, however, it announced that the forest has a wild horse territory measuring 258,000 acres. The plan did not include a copy of the map, but some years earlier, the agency had mistakenly depicted the two territories and their middle section as one contiguous area. In the two-plus decades it took for the service to address this error, wild horses were actively managed and recorded by the service. When the Forest Service finally did acknowledge the error, though, it conducted no further analysis before opting to redraw the lines with the middle section now excluded. A group of wild horse advocates objected, claiming violations of the Administrative Procedures Act and other federal laws. Though the lower court granted the Forest Service summary judgment, a three-judge panel of the D.C. Circuit reversed Friday. “A 23,000 acre tract of land and two decades of agency management cannot be swept under the rug as a mere administrative mistake,” U.S. Circuit Judge Patricia Millett wrote for the court. Refusing to shrug off the agency’s error as inconsequential, Millett emphasized that “there is no ‘oops’ exception” to how agencies make decisions. She balked at the claim that excluding the maps changes nothing. An attorney for the wild horse advocates applauded the ruling. “The D.C. Circuit sent a strong message to the Forest Service that it must manage these public lands in accordance with federal laws that afford these wild horses protection from death, harassment, or other forms of interference with their wild and free-roaming behaviors,” William S. Eubanks II, of the firm Meyer Glitzenstein and Eubanks, said in a statement. Millett faulted the agency for failing to explain its decision to redraw the map and not considering whether it should undertake an environmental impact statement. The American Wild Horse Preservation Campaign is named as the lead plaintiff in the case. It did not respond to a request for comment on the decision. The U.S. Forest Service also did not respond to an emailed request for comment on Monday morning.